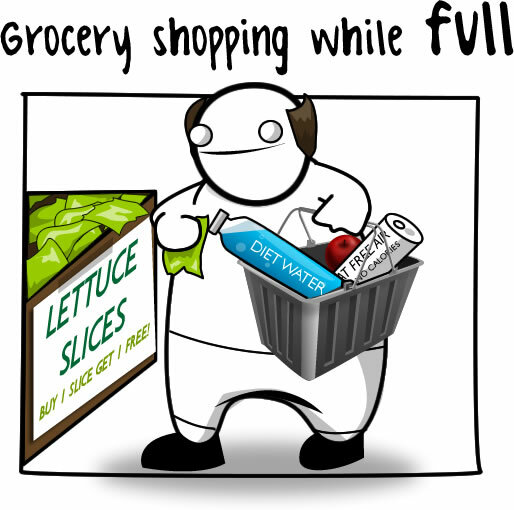 We have all had that feeling of browsing the grocery aisles on an empty stomach. Suddenly, everything in the store looks like the tastiest thing that we have ever seen and we can not wait to eat everything that we are purchasing. Not only have I been in this situation as a grocery shopper, I have also been on the other side of the counter as a cashier. I worked at a local grocery store for a year and a half and on a regular basis customers would admit that they bought more than they should have, because they were hungry. A lot of times that was their justification for buying cakes, donuts, ice cream, cookies or a whole pizza. Now that I buy my own groceries for my apartment I find myself justifying the purchase of Ben and Jerry’s ice cream, because it looked good at the store and I had not eaten yet that morning. After my own experiences and hearing the experiences of many shoppers, I have developed the hypothesis that we buy more food at the grocery store when we are hungry than if we have recently consumed food. I found a study done by Cornell University which brings data from an experiment to my hypothesis. The information that Cornell had before their own study was that a person eats and buys an increased amount of food after fasting (USC Study). The reason for this is not explicitly stated in the article, but I think that the body is in survival mode and will eat a lot to make up for the fact that it has been deprived. It reminds me of the Snicker’s commercials where they say “You’re not you when you’re hungry”, because maybe we act more animal-like and impulsive to ensure that we have a full stomach once again. Another study presented at a conference for The Society for the Study of Ingestion Behavior explains why our primal instincts come out when we are hungry. There are higher levels of a hormone called Ghrelin which was found to cause participants to pay more for food than if they had lower levels of the hormone. Ghrelin levels rise when we are hungry and could potentially cause us to make irrational decisions to satisfy our appetite. Knowing this information already, Cornell took things a step further. Cornell’s study took into account how healthy the foods were that a person chooses to eat after being hungry. Participants were asked to fast for five hours prior to the experiment and then they were split into two groups. One group was not given any food while the other was told to eat from a plate of crackers until they felt satisfied. Next, they were told to shop in a fake online grocery store. The results showed that shoppers who were given the crackers before shopping chose less high-calorie foods than shoppers who were left hungry. In conclusion, food deprivation, even short-term, could lead to higher calorie food purchases. In this experiment, the food given to participants was the control. The independent variable was the amount of food given to participants before shopping and the dependent variable was the amount of high-calorie items selected. In my opinion, there could be an argument for reverse causation. 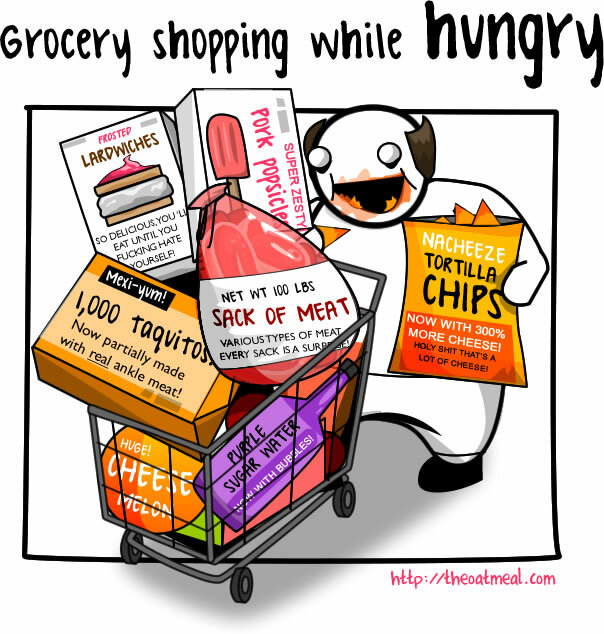 For example, if I knew that I was buying a high-calorie item to eat, maybe I would not eat prior to grocery shopping. I think that for the most part this experiment was done pretty well. They conducted this test over two days during two different times. Low-calorie alternatives were offered that were substitutes to high-calorie offerings which is similar to products in a typical grocery store. This gave participants the option to choose either one so that we could test which they would buy in real life. Some confounding variables could be differences in lifestyle, familiarity with food choices, preferences and age. There were 68 participants so I think that it would be a good idea to test more people on this and look for any patterns in gender, age, nationality, etc. This entry was posted in Uncategorized on October 24, 2016 by vek5025. This blog post is very relatable because I think everyone has been in this situation at least one point in time. I know for sure when my mom comes home from the grocery store with a ton of food we don’t even eat that she definitely didn’t eat anything yet that day. Or when I am starving so I go to the convenient store in the commons and buy everything in sight. After reading your post I now understand why that happens but does it necessarily have to be unhealthy foods? I get it most commonly will be unhealthy items because its given that french fries will fill you faster than carrots would but there has been times where my mom has binge bought healthy foods as well. This very relatable post is very well organized and straight forward. I didn’t need to make any assumptions because you were very good at explaining. The only things I would change is the length, I would add a conclusion and a little more detail. This topic doesn’t have a lot of concrete science you can talk about but there is probably more information that you could find to branch off of this idea of hunger. You mentioned how the body goes into survival mode when hungry so doing more research with that could help. How does hunger affect the body and why does that make food more appealing? A little more science other than the experiments would had been great. Otherwise, I really enjoyed this post! Here’s the science behind hunger, check it out! I liked the post considering the fact that I my father used to advise to not go for shopping when I am hungry because I will buy too much food than what I have originally planned to buy; however, he did not tell about a study that was conducted that could provide evidence for it or could at least explain the mechanism behind it. Reading the post has also remind me of the study that Andrew explained in class about how one’s consumption could vary depending on how much food is on his/her plate, which could have a correlation to the study mentioned in your post. I also think that the amount of food people buy in the grocery depends on the how well the food grocery management creates incentives for consumers to buy more. This is a link that shows how markets convince consumers to buy more of their products. I think that this is a very interesting blog post! I found all of your points to be very relatable to my own tendencies. Whenever my dad comes back from the grocery store with his favorite unhealthy foods, he claims that he was starving while shopping. For me, whenever I have not eaten all day, I think that it is more acceptable to stuff my face with an unhealthy, large meal. I found a blog post with the title “fast all day and feast all night.” It claims that even if you are making up for starving yourself during the day with a large meal later, it could effect your performance throughout the day time.